How to Donate a Used Car - It's Easier than you Think! So you’re interested in donating a used car to a good cause but aren’t exactly sure how it all works? 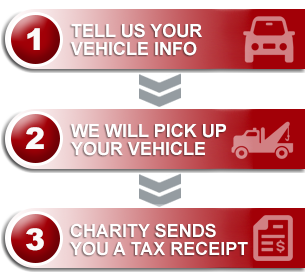 At Donate A Car Canada, we take an active role in ensuring your vehicle is donated safely and securely, using reputable agents and companies across the nation. We strive to make the process as easy as possible for both you and your charity. Once a vehicle is donated we assign it to an auction or recycling agent. When the vehicle sells, the funds come to us and we forward the money to the charity you have chosen. The charity will then send you a tax receipt for your valuable donation! There are a few simple steps to take once you have decided to donate your used car through our program. Proceed to the DONATE NOW tab to fill in your information. First, you will be asked a few questions to ensure your used car qualifies. Where is your vehicle located? Would you like us to pick up your used car, or will you be dropping it off? Mailing address (for tax receipting purposes), and contact information. Condition of vehicle – Any information pertaining to the condition of your used car is very helpful in choosing the best processing method to maximize your donation amount. For Example: Does it have a flat tire, has it been in an accident, is the engine seized? You can also note your preference to have the vehicle recycled or auctioned. Once you submit your information, our website will show you a review of all the information you entered, and ask you to agree to the terms on that page. Once you have read the terms, click on the box at the bottom of the page, and click submit. You’re vehicle will now be entered into our system for processing. You will instantly receive an automated email advising of your successful submission. If you do not see the email, be sure to check your junk folder. It is common for emails from an automated server to land in there by mistake. At this point, we begin working on processing your vehicle. We will contact the appropriate agent in your area, and will be in contact with you via email within 24 hours. We hope that this has helped to explain our process. If you have any further questions please review our FAQs, and you can always reach us through our Contact Us page. If you are now ready to donate your used car, please Click here to proceed. Thank you in advance for your consideration and generosity!